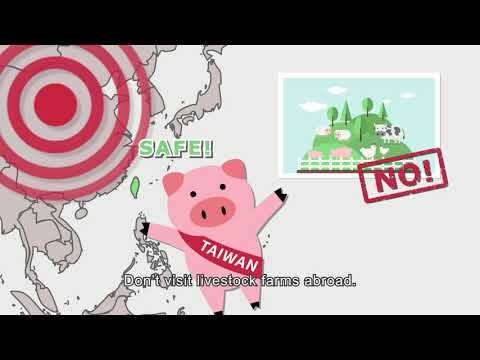 ﻿ What kind of food products am I allowed to carry into Taiwan regarding tightening border inspections against African swine fever(ASF)? What kind of food products am I allowed to carry into Taiwan regarding tightening border inspections against African swine fever(ASF)? If food products carried comply to the regulations(Note 1~3), it is allowed for travelers to carry into Taiwan free of duty, or duty payable upon declaration(Note 4). If travelers have duty payable articles to declare or any doubts on goods you carried upon arrival, you could proceed to the red (goods to declare/customs service) channel and consult to customs officers. We are pleased to assist with your clearance. 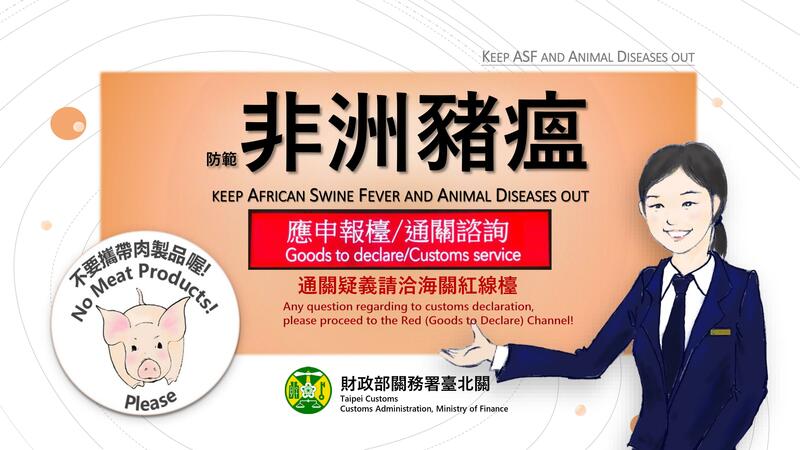 Since ASF draws great attention recently, prohibition of importing of pork from infected countries is well known. However, in order to prevent risks associated with animal or plant disease infection or pest, importation of all kinds of animal meat, plants, and its products shall be compliant with the quarantine regulations as well. The quarantine inspection could be waived for certain food products. 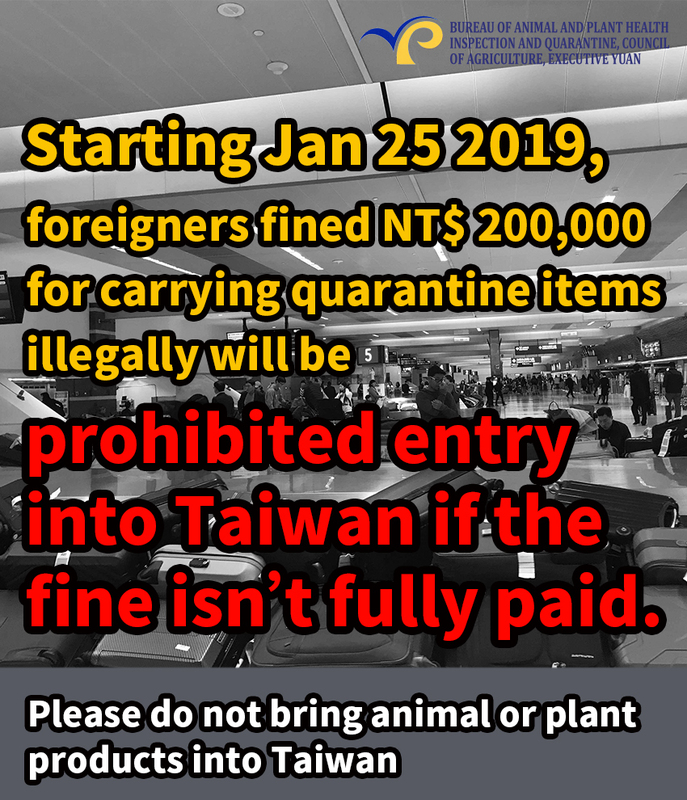 Travelers could refer to the reference table released by the authority of quarantine, the Bureau of Animal and Plant Health Inspection and Quarantine (BAPHIQ). 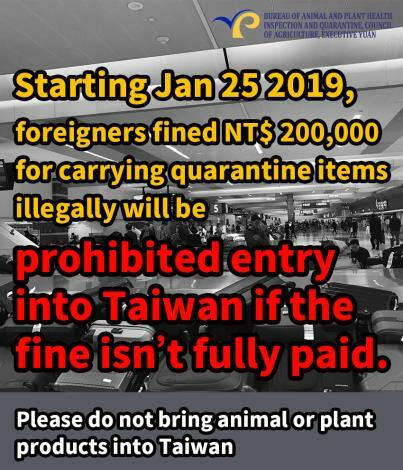 Further questions regarding quarantine, please contact the BAPHIQ at 886-2-3431401 or by email(baphiq@mail.baphiq.gov.tw). 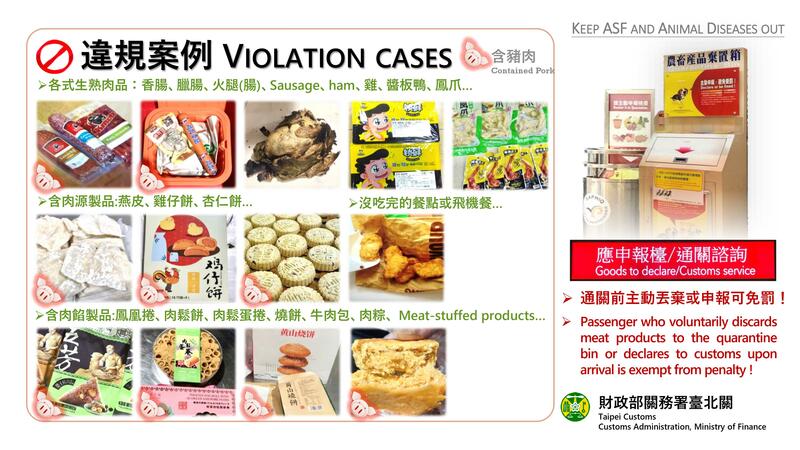 Meat and its products from disease-infected areas are banned from importation. Food products with meat ingredients or stuffing. Pets (cats, dogs and rabbits only). Cakes, breads or biscuits without meat ingredients or stuffing. Dried, pickled or modulated aquatic products. Refined animal oil or fat, e.g., butter. milk powder, flour, or cheese. Fresh fruit, live insects, soil, plants contaminated with soil, and plants from pest-affected areas are banned from importation. Live, fresh, or chilled plants. Seeds, e.g., chia seeds or unpopped corn kernels. Baked nuts or coffee beans. Dried or pickled fruits in commercial packaging. Dried and ground spice powder. Honey without bees and its pupae. (1)Food products in tablet or capsule form (except for medicines): Each passenger may carry up to 12 bottles (boxes, cans, bars, sticks) of each kind and no more than 36 bottles (boxes, cans, bars, sticks) in total. (2)others(e.g. 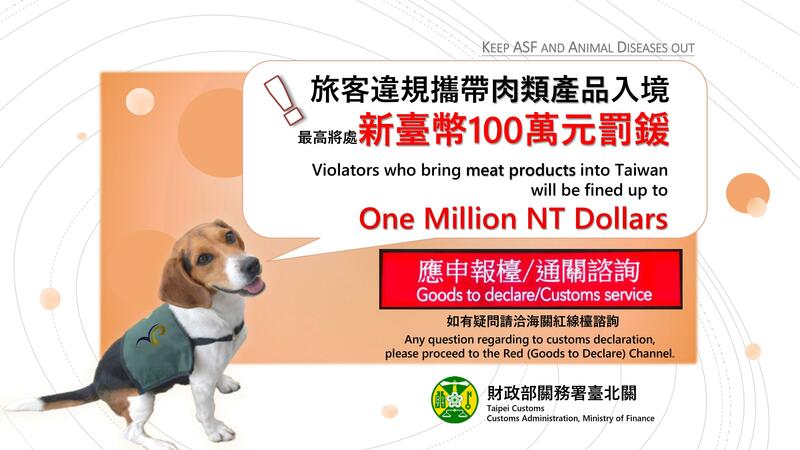 liguids,pwder...): According to the announcement of the Ministry of Health and Welfare, Executive Yuan, if the quantity and the value of food products are under 6 kilograms and less than US$ 1,000, the food inspection could also be waived. Or else, applying for the food inspection to get an import permit to the Food and Drug Administration(TFDA) is necessary. 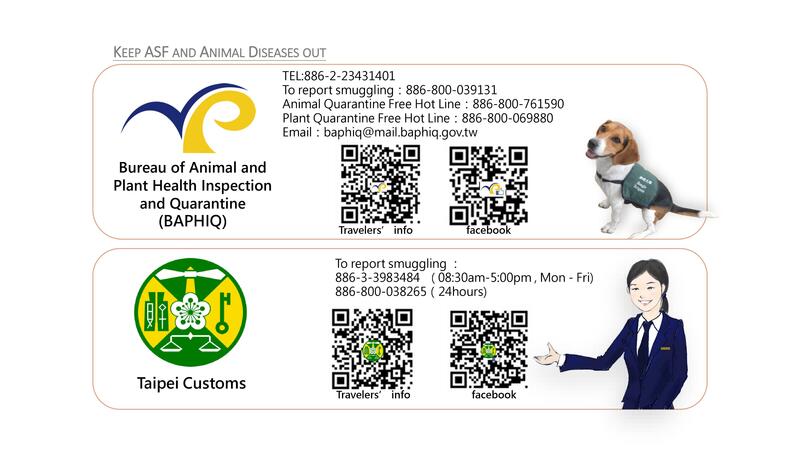 (3)For applying the food inspection, please visit the website of the TFDA or contact them via +886-2-27878000. (1)Importation of CITES-listed species, such as sliced American ginseng (Panax quinquefolius), a permit or certificate issued by the management authority of the state of export or re-export is required. Further information, you could refer to the CITES website . (2)Furthermore, importation of species regulated by the Wildlife Conservation Act also requires a permit issued by the Council of Agriculture (Protected Land Species) or Ocean Affairs Council (Protected Marine Species). (3)According to the article 24 of the Wildlife Conservation Act, no import or export of live marine mammalian wildlife or products thereof is allowed, e.g., seal oil. Articles carried for personal or home use which are not exceeding NTD 20,000 in aggregate value (except for controlled goods, tobacco, and liquor products) shall be exempt from duty. 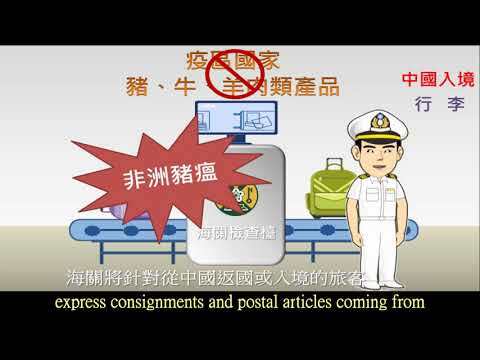 Where articles exceeding NTD 20,000 in aggregate value, the customs tariff shall be levied on the excess portion of such articles. Please be noted that if the total value of articles carried exceeding USD20,000, a permit issued by the Bureau of Foreign Trade is required for customs clearance.